TaeKwonDo Connection is committed to developing healthy bodies, minds and spirits. We provide quality Taekwondo instruction with strong emphasis on discipline, respect and character development. You will receive lots of personal attention from our staff and feel confident about your progress. Learning is key to all our work and our teaching is done as if we were working with our own family. Taekwondo means "The Way of the Fist and Foot." Although an ancient and once secret Korean art of weaponless self-defense, it is now a sport in which either two persons practice methods of unarmed fighting or one person can exercise for both physical fitness and self-defense. Still primarily a defensive art of self-protection, Taekwondo has in the past two decades also rapidly developed as an injury-free international competitive sport. The Taekwondo student has through many years of daily practice developed their feet and body into hidden weapons of defense. They can respond with lightning-like speed and explosive force should they be physically attacked. Taekwondo has been called the ultimate in self-defense because it trains reflexes so keen and accurate that students can effectively defend themselves from attack by multiple assailants. Unlike most other sporting activities, Taekwondo promotes the improved formation of one's character. In the friendly yet competitive atmosphere of this amazing art form, students workout, sweat, and put out their all together, pushing each other to their upper potential and beyond. The Taekwondo master teaches the importance of both physical and mental conditioning by building up his student's self-confidence, self-respect, and self-discipline. When free-sparring, protective equipment is worn; moreover, this is not to be a bloody street brawl, but point sparring. Although knowing valuable self-defense skills generates a tremendous sense of security, the true martial artist should be able to walk away from potential or threatening fight situations without a loss of self-esteem; moreover, ego gratification is never required. Ultimately, the sound mind in a sound body will succeed at its life's calling. 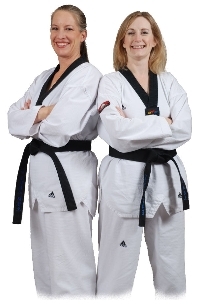 Taekwondo instructors Wendy Santamaria and Cathy Craughan have been training in the greater plateau area since 1999. Their instruction develops strong physical abilities along with emphasis on personal development, leadership training, and work ethic. Our Taekwondo classes are lots of fun and a GREAT workout!